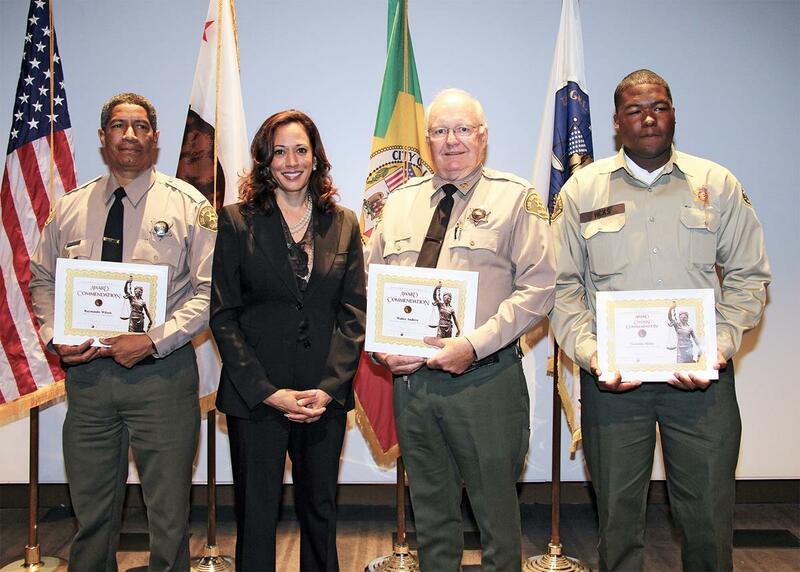 [L to R] Deputy Raymundo Wilson, Attorney General Kamala Harris, Reserve Captain Walter Andrew (retired CSO), Explorer Nicholas Hicks. The Palmdale trio received California Attorney General Commendation Awards on July 25. Sheriff Lee Baca, LAPD Chief Charlie Beck and several other law enforcement Captains were in attendance. Peace officers from other Los Angeles area police stations were also awarded. LOS ANGELES – Accolades continue to come for the Palmdale trio who rescued a man trapped underneath a car last year. California Attorney General Kamala D. Harris on July 25, 2013 presented commendation and valor awards to peace officers and citizens nominated for their efforts to protect public safety in 2012. Retired Palmdale Community Service Officer Walter Andrew, Los Angeles County Sheriff’s Deputy Raymundo Wilson, and Los Angeles County Sheriff Explorer Nicholas Hicks received the California Attorney General Award of Commendation for their lifesaving efforts. “We did the same thing any of the deputies I work with at Palmdale Station would have done in the same situation and got the man unpinned from under the car,” said Deputy Wilson. Explorer Nicholas Hicks said he always enjoys doing ride-alongs at the Palmdale Sheriff’s Station. He said he was especially glad to be able to help rescue a person in need on that day. On March 21, 2012, Palmdale Sheriff’s Station received a call regarding a man trapped underneath a vehicle that had fallen off a jack. Deputy Raymundo Wilson and his ride-along, Explorer Nicholas Hicks of Palmdale, arrived at the location at the same time as Reserve Deputy Walter Andrew. The trio rushed into the open garage and located the victim, who was pinned under the engine block of a vehicle that had its front tires removed. They saw the man was semiconscious and struggling to breathe. Without hesitation, Deputy Wilson and Reserve Deputy Andrew took hold of the front bumper and lifted the vehicle with all the strength they could muster while Explorer Hicks repositioned the fallen jack. They immediately used the jack to lift the car up high enough for them to pull the victim out from underneath the car. The victim was transported to a hospital and treated in the emergency room. According to the attending physician, the man received extensive injuries and would have suffocated had it not been for the trio’s quick actions. Andrew, Wilson and Hicks were previously recognized by both the City of Palmdale and the Los Angeles County Sheriff’s Department for their lifesaving efforts. 1 comment for "California Attorney General honors Palmdale trio"
Good job deputies! Way to set the standard for community service!